PHUKET: Officials at the Tourism Business and Guide Registration Phuket Office are struggling to proceed in a case relating an alleged fake tour guide photographed stepping on coral at Koh Racha Yai due to insubstantial evidence, after local marine conservation group Go Eco Phuket reported the case to the office on Monday (Jan 8) along with the alleged identity of the guide. 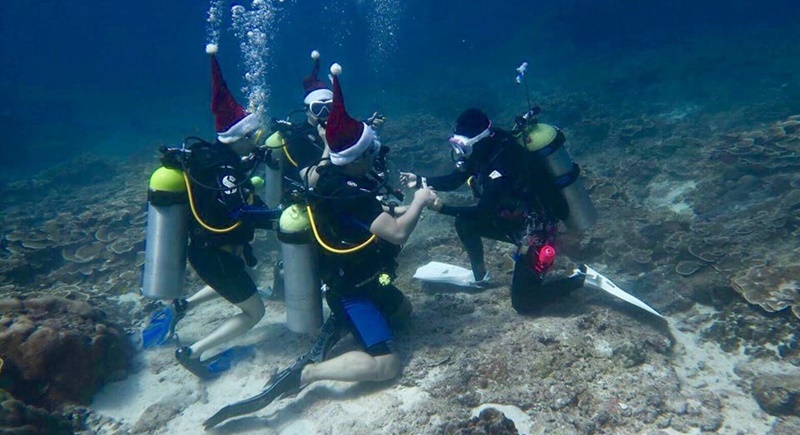 Phattara Lamontri of the Tourism Business and Guide Registration Office told The Phuket News today (Jan 10) that the evidence, a single photo, is insubstantial to prove the connection between the divers and the company name provided by Go Eco Phuket. “We are still looking to find evidence of the connection between the single photograph provided and the company name provided by Go Eco Phuket,” said Mr Phattara. “They obtained the company name via the name of the boat, but there is no photo or evidence of the boat name. It is difficult to proceed legally with no other evidence because once we go to court it will just fall apart. “It would be different if there had been more photographic evidence, such as of the boat, taken above the water, or where you can see clearly the faces of the divers,” he added. Secretary of Go Eco Phuket, Ittiput Schadt spoke to The Phuket News today and said, “A friend of ours (at Go Eco Phuket) sent us this photo. It was taken on Dec 27, however, we did not want to report it until we had obtained information about the fake tour guide pictured, in order to report it to the Department of Marine Coastal Resources (DMCR) and Tourism Business Registration Office,” he said. “Right now, we are working to provide the officials with additional evidence that they require. We are asking for help from the media, if anyone knows any information,” he added. “We reported it to the Tourism Business Registration Office on Monday along with the suspected identity of the ‘tour guide’, who we believe is Korean, does not have a tour company licence, or a certificate to take others on dives. “We deducted the identity because the supplier of the photograph had noted the name of the boat. From this, we found out the tour company name, and then from the Phuket Business Registration Office that the company was not registered,” he said. “Eventually we got a full name of the suspected fake guide, her address, and her workplace. “We are trying to find more evidence to arrest her based on lack of a work permit. The DMCR and marine officers have also been notified of the case. Please wait several more days while we proceed,” he added. However, when The Phuket News contacted Director of the DMCR Phuket Office Watcharin Thintalang, he said he had not yet seen the image and requested that The Phuket News forward it to him. “I have not seen this yet. Please send it to me,” he said. I know a few very good Thai dive instructors (though very few who don't have dual citizenship). Diving is a safety critical activity, like driving. But experience shows that your average Thai will bring the same level of safety considerations to both. And Thailand has the worlds deadliest roads. "Racist or xenophobic comments against Thai- Divemasters "or against Thais generally.On here? Impossible! Especially the expats commenting here are "goody goody"! A lot of racist and xenophobia comments against Thai Divemasters/Instructors. In Phuket, many foreign Instructors don't like to see Thai Divemasters/Instructors aboard day dive boats because they are scare that they will report foreigners working illegally as dive guides or for bad behaviors. Many Thais have been moving to Thai-owned dive centers or to other dive destinations in Thailand. I never dive with a thai dive company. Maintenance of, often old,  dive equipment is sloppy. Often de filters in the air compressors are old and dirty, so you dive with dirty air in your tank. A complete and absolute absence of 'safety first' thinking among thai dive masters and instructors. Boat drivers who use engines while divers are down. Thailand protecting Thai's doesn't work in this instance, to be an effective dive instructor in the tourism sector you must be thorough in your approach and communicate in perfect English, no Thai can do this, I would never trust a Thai dive instructor, too sloppy. Nice Photo. Yes, who is the Dive master or Dive Instructor? Below the surface, as shown,  we not talk about tour guide. TAT license, work permit, dive instructor license, registered tour guide, these are all different things. The story doesn't make the details clear and obviously 'Go Eco Phuket' don't know either. How do they know this person didn't have a work permit? That's not a matter of public record. By law, foreigners with or without valid work-permits, can't work as a Divemaster or Dive Guide as well to work as freelance Instructors for other dive companies.